Jordan Spieth has someone clipping at his heels. 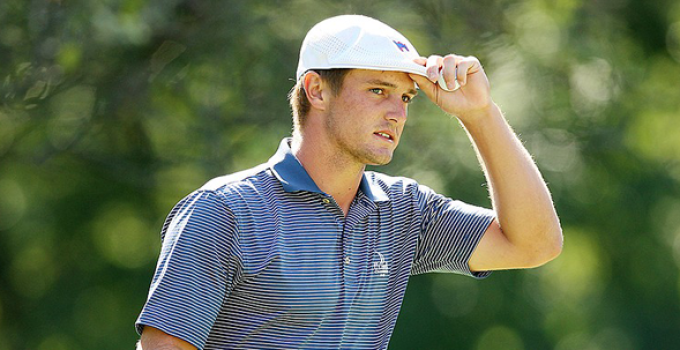 Golf’s up-and-coming star, Bryson DeChambeau has accomplished a lot by the age of 22. He won the U.S. Amateur and NCAA Championships last year, joining Jack Nicklaus, Tiger Woods, Phil Mickelson, and Ryan Moore as the only golfers to hold both trophies simultaneously. He finished T21 at The Masters to earn the Silver Cup as low amateur. He also didn’t waste any time after Augusta National, turning pro shortly thereafter and signing a multi-year deal with Cobra Golf and Bridgestone. Then came his professional debut at the RBC Heritage, and what a memorable one it was. DeChambeau navigated the tight fairways and small greens of Harbour Town Golf Links to finish T4 and cash his first pro check for $259,600. Justin Ray, Senior Researcher for Golf Channel, tweeted about other noteworthy first professional payouts: Nicklaus made $33.33, Mickelson’s was $4,400 and Woods’ was $2,544. Bryson’s swing has also been getting a lot of attention; most compare it to the legendary Moe Norman. Bryson’s irons and wedges are all the same length, measuring 37.5 inches or about the length of your average 7 iron. His reasoning is shafts the same length requires less adjustment from club to club. He keeps his hands much higher on the grip, stands very upright and swings with a one-plane motion keeping his wrists very flat. So where did his unique swing come from? For starters, Bryson majored in Physics at Southern Methodist University. He’s a disciple of Homer Kelly’s “The Golfing Machine,” and even said during a press conference that “Scientists are artists” (which they most certainly are, just like golfers). So, with all his recent success, a very important question got lost in the shuffle: could DeChambeau make the Ryder Cup team? It’s not out of reach; currently he doesn’t have the necessary A-3 classification since he is playing on sponsor exemptions with no official status on the PGA TOUR. But that could all change if he earns enough points / winnings. From his swing to his clubs, his old-school fashion and sense of humor, Bryson is as unique as they come. I’m looking forward to what’s next for this young superstar.